Recipe this week is gluten free Belgium waffles. These are beautifully crispy on the outside and fluffy on the inside. The good news is that they are also dairy and refined sugar free making them super healthy but yummy at the same time. My sister and I just can’t get enough of them! We have been eating waffles non stop. You can use any topping of your choice. We used coyo coconut yoghurt with strawberries and raspberries. Another good choice is peanut butter with chopped nuts, banana, maple syrup and coconut shavings. Which ever topping you go for we hope you will enjoy them as much as we did. To make good waffles you need to make sure that your waffle maker is piping hot otherwise the batter will stick and make a mess. Follow the instructions on your waffle manual. Also make sure to grease your waffle irons with coconut oil when you are ready to make the waffles. Another useful hint is not to over fill the waffle maker with the batter otherwise it will pour out. Start by pouring the flour, salt and baking powder in a bowl and whisk making sure all the ingredients mix together well. In a separate bowl mix all the wet ingredients; eggs, milk, coconut oil, vanilla extract and sugar. Whisk all the ingredients well and then add to the dry ingredients and mix. Once the batter is ready, pour in the waffle maker and cook for 3-4. Once ready serve hot with the toppings of your choice. Enjoy! 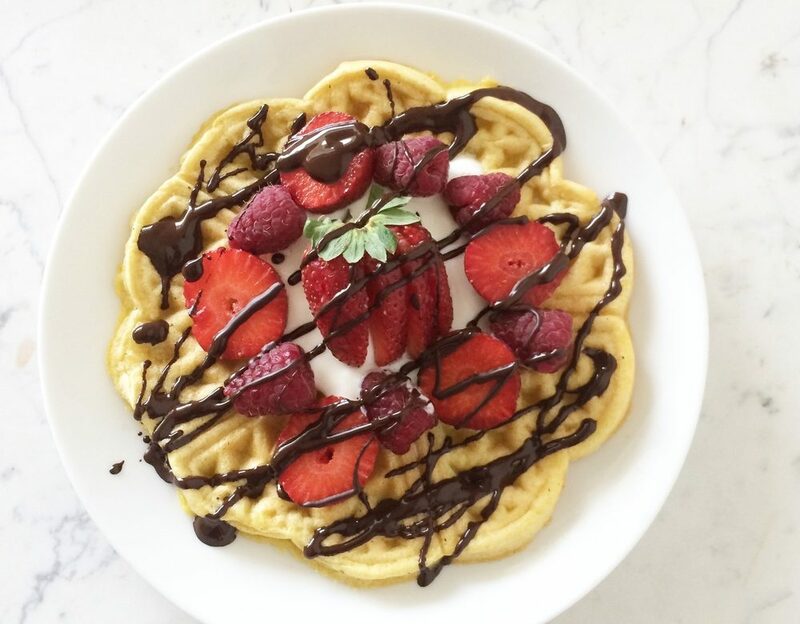 Waffles that are (sort of) healthy? What’s not to love!! They look delicious.